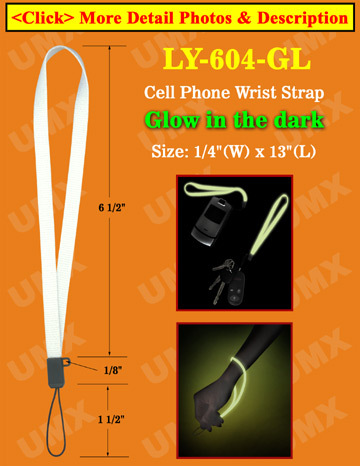 The glow in the dark cell phone wrist straps or cellular phone wrist Lanyards come with un-detachable phone strings. Any custom printed or custom size models available. We keep large inventory in stock with wholesaler's low price to wholesalers, distributors or individual. The straps can put on your wrist or bag straps easily. Not only for cellphone, the neck straps or lanyards can be used to carry cell phone accessories too. The universal string on the straps can be used to carry your flash players, flash drives, flash media, USB drives, memories, camera, handheld PDA, GPS, meters and related accessories etc. Custom Imprint: Custom printed straps Available. Custom Size: Any custom size straps or designed Available. Custom Color of Straps: Available with minimum order of 3,000 pcs. Custom Hardware: A variety of custom hardware attachments, buckles or connector available.